I joined clMOOC late, but was welcomed warmly, which motivated me to do several of the first assignments within a few hours. One assignment was to create a learning map, shown below, which helped me place my career in a new pattern, based on key learning periods for me. While items 1 and 2 were years of intense (sometimes painful) growth before my career began and which were heavily influenced by teachers, item 4 occurred several decades into my career when I relied heavily on the internet. It was Just In Time learning as I grappled with having to mediate conflict and bridging cross-cultural issues, etc. I was a very big internet Taker, which without question enabled me to conduct a job that I thoroughly enjoyed. Today I planned to prepare something more than this post for my clMOOC colleagues, but again it was filled with Taking, converting it into a very enriching day. The themes of clMOOC and my previous etMOOC were that one must Make and share. etMOOC actually motivated me to begin this blog and test all kinds of tools. I hope to continue that soon again, electricity permitting. Namibia is about the size of France and Germany combined with a population of approximately two million, so one can travel for long periods of time without seeing anyone. One of the striking features of Namibia is the often glorious blue sky. The red sand dunes of Sossusvlei are stunning, as shown in a clip from a production by schalkallroundsafaris on YouTube. The society is rich in multiple, very distinct, cultures. The Basters, for example, are descendants of the Dutch and indigenous Africans who traveled to Namibia from the Cape Colony in the late 1860s. The Western influence can be seen in the Baster dancing style and the Victorian dresses of the Herero in the clip below, which is edited from a YouTube post by Michael Paskevicius. Windhoek is a modern, clean, orderly city, which unlike so many African capitals has wide, well-maintained spacious streets that easily accommodate the traffic.The clip below is from posting on YouTube by extrpesidente. While the excellent physical infrastructure is a positive legacy of South African colonial rule, the downside is that the society was affected by apartheid. This can be seen in the area of Katatura township on the outskirts of Windhoek where non-whites had to live prior to the Namibia's independence. The longer original video can be seen at mynamibiatourism and journeys. From 1884 to 1915 the German Empire ruled Namibia, and one can see this legacy most spectacularly in the coastal city of Swakopmund. The original video is a production of MediaOnscreen. I joined the Mozilla teachtheweb online course and joined its Google Community where Sarah Gross shared her webremix that led me to her Vizify introduction. Thank you. I've been searching for a map with the ability of Visizfy to visualization of my career bouncing between and within two continents. This online course is certainly going to stretch me even further and I am pleased to introduce myself to the group. The Kingdom of Swaziland, approximately the size of Wales, has been inhabited since prehistory by one ethnic group, the Swazi, which makes the nation one of the unique countries in sub-Saharan Africa. Swaziland has beautifully varied geography from the mountainous west to the lowland plains in the east and is surrounded by South Africa and Mozambique. Below is a clip of a video that shows a village being approached from surrounding mountainous beauty. We continue with our dancing theme that has transitioned from Dutch dancing (in Iowa USA), Cameroon dancing, Tanzanian dancing and now to Swazi dancing. Swaziland culture is colorful, and men and women dance with incredible energy, as shown in the two clips below from a longer video. Below is a quick tour of Mbabane, the capital city. In the background one hears a choir singing, which comes into view later. Note traditional melody and tempo from the foregoing clip. Swazi citizens embrace their culture with active participation in annual ceremonies. Below is a video of the Ncwale ceremony that lasts from late December to early January each year. The King disappears from the general public into a sacred enclosure where he is given the first fruits of the season, and the symbolic burning of his bedding and the slaughter of cattle signify the beginning of a prosperous new year. Swaziland is most famous for the annual Umhlanga (Reed Dance) ceremony in which scores of single maidens, wearing colors that reveal different family status in relationship to the king, parade in front of the king who chooses another wife. In practice the selection is orchestrated behind the scenes before the actual parade. While the preservation of the kingdom and culture is widely embraced, the behavior of King Mswati III is drawing criticism from various quarters. In 2008 he ordered 40 new BMWs to ferry guests for his 40th birthday. Four years later the king proudly revealed a personal jet, costing about $46 million, as a gift to himself. Although he has a personal fortune estimated more than $100 million, the king has absolute control over all public institutions, including the national treasury, to fund his wishes. Meanwhile, the economy is deteriorating and it estimated that 40% of the nation is infected by HIV, which King Mswati III himself acknowledged below as a threat to the future existence of the nation. Having very fond memories of our stay in Swaziland in the mid-1990s, it is sad to witness the socio-economic deterioration of the Swazi nation. 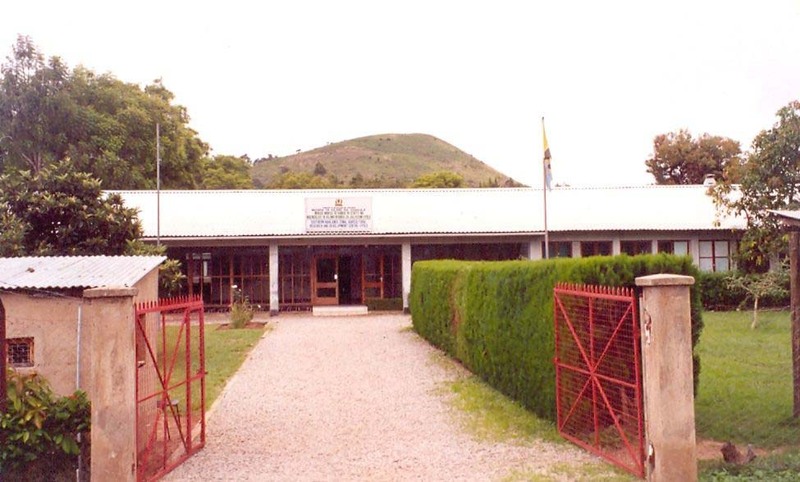 Below are a photos of the administrative and teaching blocks of the Uyole Agriculture Training Institute and Uyole Agriculture Research Center, just a few kilometers outside of Mbeya City in the Southern Highlands of Tanzania, When I lived and worked there in the early 1980s, it was one of the premier training and research centers in the country. I would take my diploma agriculture students into the villages where we helped farmers learn how to use their cows to plow and cultivate the land. For those unfamiliar with how animals can be used to conduct agricultural work, I'm posting below a YouTube video taken in the U.S. of one of the best trained teams I have ever seen. Many decades have passed since I lived in Mbeya, but I found a Vimeo video uploaded in 2002 that captures the sights and sounds as I remember them many years ago. It is taken during the cold, dry, dusty season in Mbeya when one needs at least a sweater at dawn and dusk. The story line is of a young boy who seeks directions to a community skills training center in Mbeya from various roadside shops and friends playing soccer. He is unsuccessful until, in the second clip below, he locates a person at a carpentry shop who gives directions to the school. The relatively low tech agricultural solution of animal traction never seemed to gain much support in Tanzania, which still remains largely reliant on the hand hoe farming. There are a number of other low tech solutions such as the ingenious one published by Global Cycle Solutions. The clip below is taken from a longer Vimeo video in which GCS co-founder Jodie Wu gives her elevator speech about a bicycle powered maize (corn) sheller. Mobile phones are pervasive throughout Tanzania and offer potential high tech solutions for agriculture. But this needs to be combined with high touch approaches that pay attention to social dynamics. 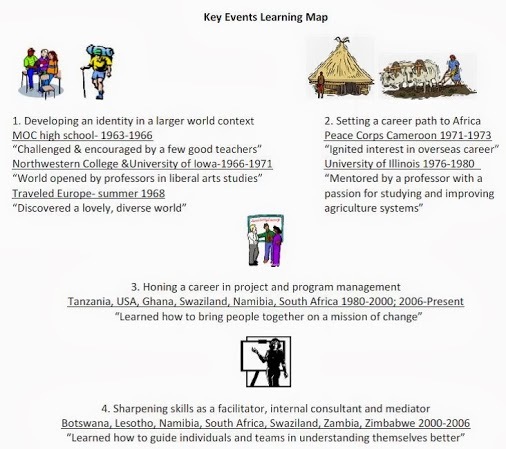 The clip below is taken from a longer video about an IFAD project in Tanzania.It demonstrates how high tech solutions must be combined with high touch approaches in order to lead to sustainable results. The Southern Highlands of Tanzania is stunning in its remote beauty. The two clips below are taken from a longer YouTube video recorded from a bus traveling through the towns and countryside in Mbeya Region. As the bus speeds up and then slows down, one can see the many shops along the road, people chatting in small groups, TV dishes on zinc-roofed houses, banana trees everywhere, and many other images that bring back good memories. I can now smell the fresh air of the green rolling hillside as the bus breaks free from the cities and villages. Let's take a drive in a heavily bicycled and pedestrian market street of Kyela which is a cocoa growing area along Lake Nyasa and which is the small city entrance to the neighboring country of Malawi. The clip below comes from a longer YouTube video. Finally, when tourists think of Tanzania, they often think of the Serengeti, Mt. Kilimanjaro, and Ngorogoro Crater in the north and Zanzibar off the coast. Few know about Ruaha National Park, the largest national park in the country. The Ruaha National Park, along the Selous Game Reserve farther to the south and east, are largely undiscovered gems for those seeking a less traveled tourist path. The south of Tanzania has much beauty in nature and people. I returned to the U.S. from Cameroon in 1973. After working in Peace Corps recruitment and completing graduate degrees with an emphasis in international agricultural education/extension, I received a contract in July 1980 with an American university, which assigned me to a farmer's training project in Mbeya, Tanzania. The experience in the beautiful Southern Highlands until December 1985 cemented my relationship with sub-Saharan Africa for the rest of my career. There are many diverse cultures within West African and East African nations. However, while East African dress is brightly colorful, the designs and materials tend to be simpler than those in West Africa. The music in East Africa often relies on percussion drums and basic horns, while West Africa also includes traditional bows and strings. This contrast between Western and Eastern Africa is immediately apparent in the dancing seen here when compared to the Cameroon dancing clips in the previous post. Below are two clips of a dance by the Wanyakusa tribe, which is the predominant ethnic group in Mbeya where I lived for nearly six years. If one compares the longer versions of the first and second YouTube videos of the two clips below, one can more clearly see the same pattern that seem to reflect warrior dances of decades ago. It would be a mistake to conclude that there is little pride in local culture, given the contrast to the more vibrant, boisterous, and costumed previous post from Cameroon. However, it is true the East Africa and Tanzania in particular has a more muted expression of its cultural past, which is heavily influenced by centuries of Arab presence and later the arrival of the Portuguese, Germans and British, who in turn welcomed Greek and other European farmers and introduced Indians to the country in large numbers. The consequence is an accommodating and friendly atmosphere that gives a strong sense of a nation less torn by tribal rivalries that characterizes many of its immediate neighbors and their more distant continental neighbors to the West.